Ghee, a form of clarified butter, has been used for thousands of years in Indian cuisine and Ayurveda. It has seen a surge in popularity recently because it is also used on the Whole30 diet. Ghee is prepared by gently simmering butter over a low, consistent heat, and then skimming away any impurities that rise to the surface. It is then strained through a fine mesh sieve or cheesecloth to reveal a clear liquid fat. What remains is not only nutrient-rich, but also free of milk proteins, making it a good option for those with dairy intolerances. Ghee can be stored in an airtight container in your kitchen cabinet for up to three months and stored in the refrigerator for up to one year. 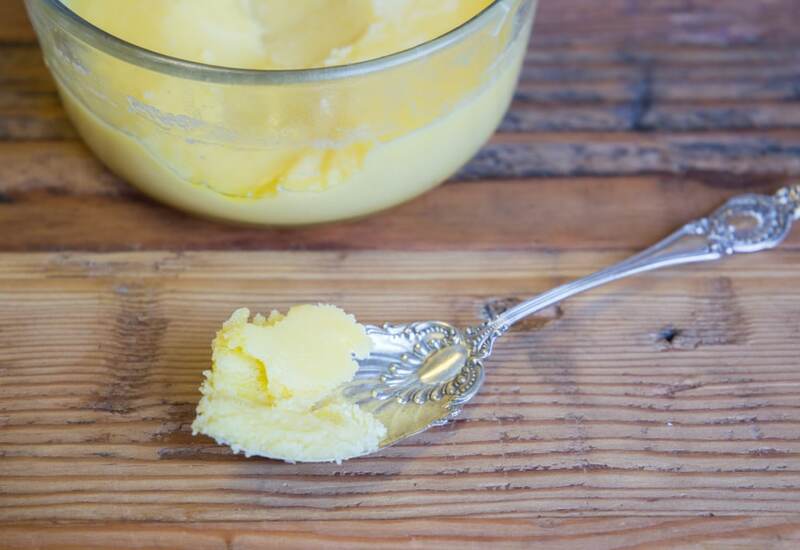 Ghee is ideal for cooking because it has a much higher smoking point than regular butter. Look for recipes from India, South Asia and the Middle East to find new and delicious ways to use ghee. Per Serving: 136 calories; 15g fat; 0.0g carbohydrates; 0g protein; 41mg cholesterol; 2mg sodium. I had no idea how easy it would be to make ghee at home. A jar of this stuff at Whole Foods has run me over 10 dollars in the past. I will definitely be making ghee at home in the future because you can choose amazing butter to start with so the quality is much better than store-bought. I'm doing Whole30 and found this recipe. While you don't actually pressure cook, I did use my pressure cooker bc it keeps such a steady heat the entire time, which is necessary to create ghee. Smells sooo good, like caramel! This made a huge batch - looking forward to using it in my coffee and for cooking. I tried this recipe out of desperation... I was trying an Indian dish and realized I forgot ghee at the store! This recipe was so easy and awesome because I didn't have to use my stove. Will be saving my $$ and making ghee at home from now on! Didn't use that brand of butter, but still got great results. This is much cheaper than buy an $8 little jar of ghee. Love it! This is a good recipe for homemade ghee. I use it in all sorts of dishes. Cooking it in the pressure cooker is quick and easy, I don’t have to stand at the stove and watch it while it cooks. Super convenient.